So there was relief when, after years of eluding the police, Kuttu was arrested in 2015. He faced at least six counts of tiger poaching in forests across the central state of Maharashtra and was held without bail. On January 21, 2016, he was taken to court to stand trial in the first of those cases, for allegedly poaching a pair of tigers three years earlier. After his court appearance, while being transported back to jail, he begged to make a restroom stop – and fled into the forest, handcuffed, successfully evading his two police escorts. Authorities launched a manhunt, but Kuttu – who is descended from a long line of traditional hunters – had vanished. There were 50 confirmed tiger poaching deaths last year, according to WPSI statistics. But the actual number may be much higher. Customs officials usually multiply known poaching offenses by 10 to estimate the true scope of the illegal trade. Another 82 tigers perished in 2016 from causes other than poaching, bringing the confirmed death toll to 132. 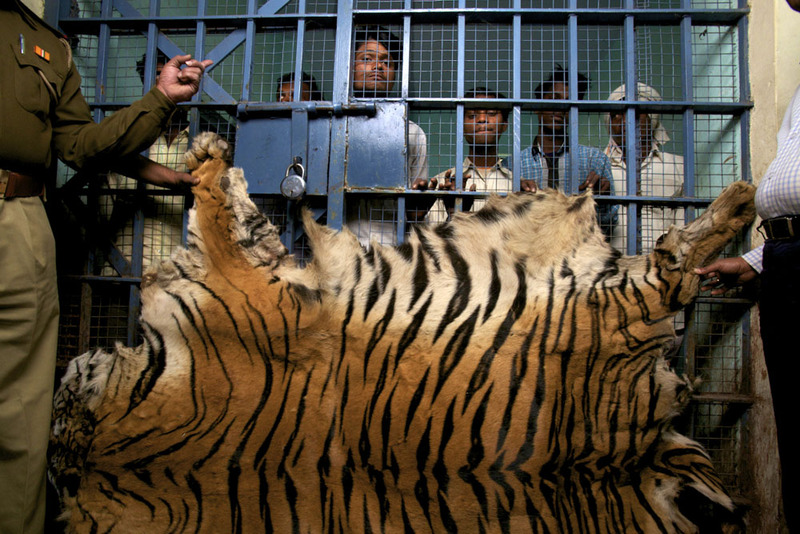 Many tigers were killed to meet a thriving illicit demand, largely in China, for pelts, bones, and other body parts. Poaching is the greatest threat to the ultimate survival of tigers in the wild. 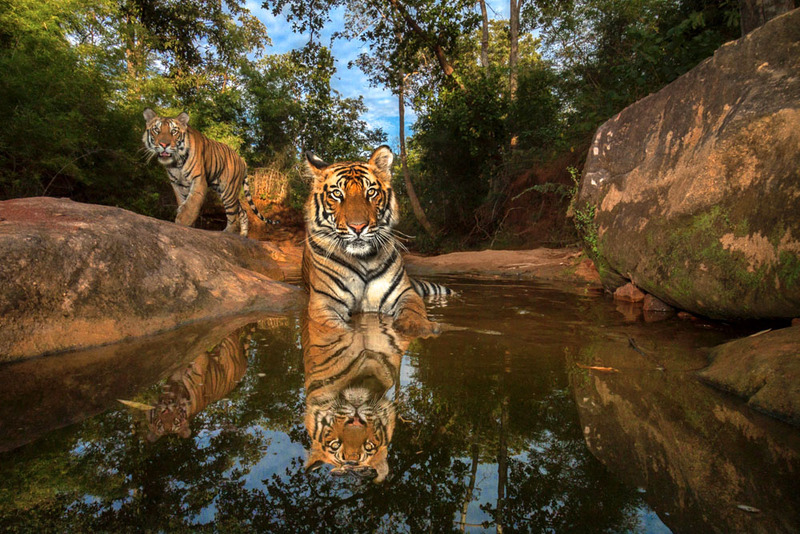 Some 100,000 of these majestic cats roamed across Asia at the dawn of the 20th century, around the time Rudyard Kipling published The Jungle Book – which he set in what is now India’s Kanha Tiger Reserve. Since then, tiger populations in Asia have plummeted by 96 percent, falling to fewer than 4,000 animals, split among five subspecies; a sixth, the South China tiger, is thought to exist only in captivity. Only a few hundred Siberian and Indochinese tigers remain. India’s last census estimated 2,226 Bengal tigers, and these animals represent the last, best hope for wild tigers – 60 percent of all left alive today. Some traditional hunting families like Kuttu’s remain nomadic or live on the fringes of society. With deep ancestral knowledge, they have become the most effective poaching gangs in India, says Jose Louies, head of law enforcement in India for the International Fund for Animal Welfare–Wildlife Trust of India. He notes that “it’s a lucrative, easy job” – and Kuttu’s family is among the top offenders. Finally, however, the family slipped up. An informant obtained the number for a mobile phone a Kuttu gang member was using – a surprising mistake since most professional poachers no longer communicate via cell phone. Police tracked the signal and located their camp in Uttar Pradesh, outside a town that hugged the Nepalese border. One of the six major trafficking routes to China crosses through the center of Nepal. Police placed the group under surveillance. Finally, on November 30, the police moved in as family members headed into a nearby town. Though the gang scattered, the police captured Kuttu – a short, round-faced, 35-year-old with a goatee. Everyone else, including Kuttu’s brother, Keru, who is wanted for trafficking tiger skins, ran off. They almost exclusively use jaw traps – crude metal contraptions forged over a blacksmith’s fire that they conceal on trails where tigers walk. They’re easy to maintain, easy to hide, and deadly efficient, catching tigers by the leg. Guns are hard to conceal, make too much noise, and leave a bullet hole in the body of the pelt. But even inside some tiger reserves, patrols are lagging; a recent study showed that less than 30 percent of park acreage is being patrolled. And Bivash Pandav, a tiger expert at the Wildlife Institute of India, is concerned that there is little accountability for poaching events. “If poaching goes up, we cover it up, with more concern over protecting one’s reputation than understanding the cause and the impact” – or finding a solution, he says. An example of the government’s lack of transparency is their website, which lists 98 tiger deaths in 2016: 2 poached, 22 seized in parts, and 57 listed without cause, despite the agency’s position that all deaths will be treated as poaching unless proven otherwise. “If a few tigers are poached from an area where there are lots of tigers, they can bounce back,” says Pandav. But tigers may then die battling over territory – or there may be fewer births for a year or two until the social order is reestablished. And poaching even a few individuals from a forest with a small number of tigers may make it very difficult for them to recover. Field studies have shown that if a population of tigers loses half of its breeding age females, that population collapses. Sharon Guynup is a public policy fellow at the Wilson Center, where she is working on a book about environmental crime. She writes for National Geographic, The New York Times, and other publications. Sources: Convention on International Trade in Endangered Species of Wild Fauna and Flora, International Union for the Conservation of Nature, United Nations Environment Program, Wildlife Protection Society of India, World Wide Fund for Nature, Yale Environment 360. 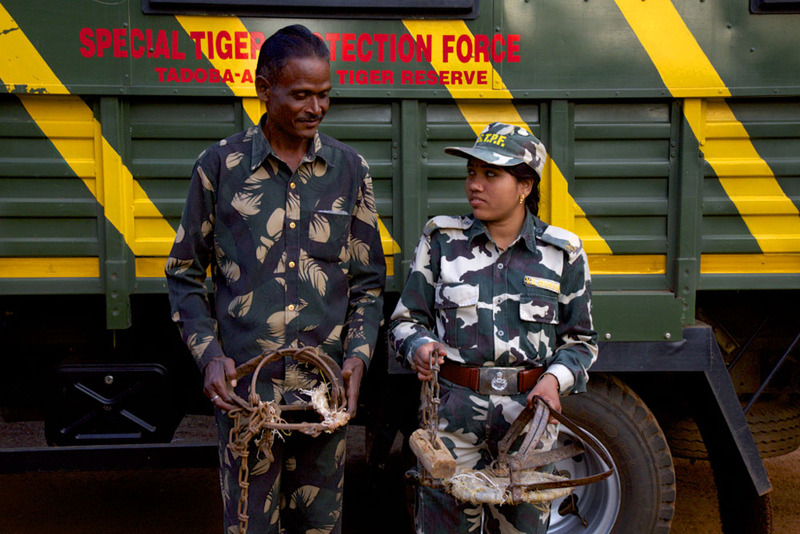 Photo Credit: Tiger skin and tigers in the Bandhavgarh reserve, used with permission courtesy of Steve Winter/National Geographic; Guards with traps, used with permission courtesy of Sharon Guynup.